❝ If you had to choose one state out of the 50 to use as a blueprint for America’s future growth plan, which state would you select? Would you select the coastal tech and entertainment giant or the heartland agriculture and industrial producer? ❝ It’s a no-brainer. Kansas has been a disaster, with giant budget shortfalls, service cuts, slashed education budgets and a brain drain with young people leaving the state. 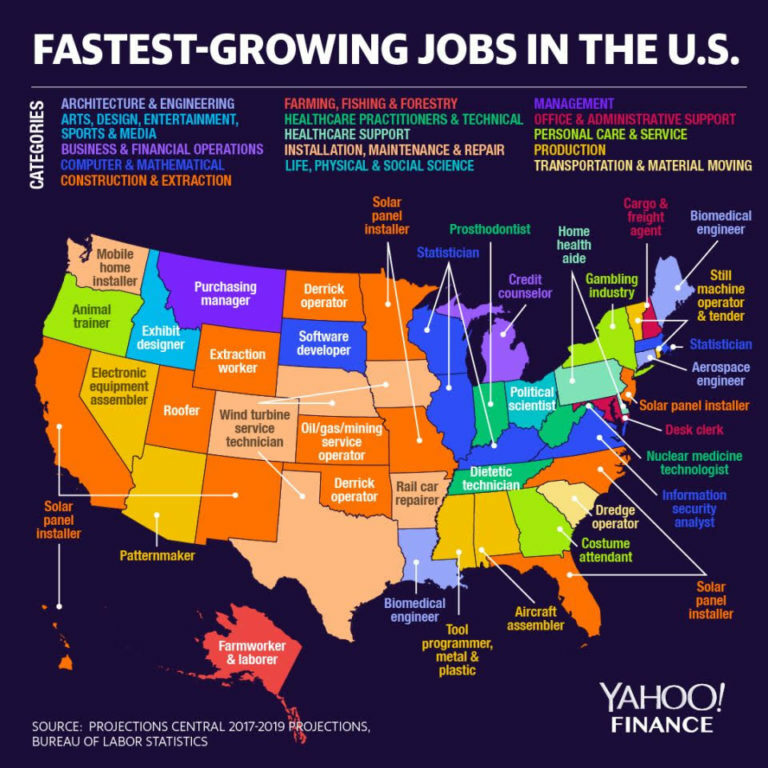 The economy has failed to keep up with growth in the rest of the country and is much weaker in terms of job gains, wage increases and gross domestic product growth than neighboring states with similar economies. In 2015, for example, Kansas had one of the worst job growth rates in the country, at 0.8 percent, adding just 10,900 nonfarm jobs. 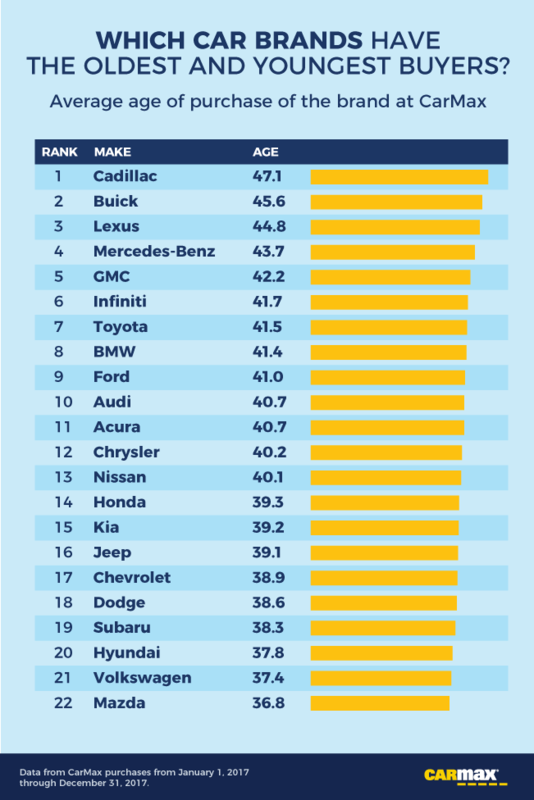 What age drivers are driving which cars? 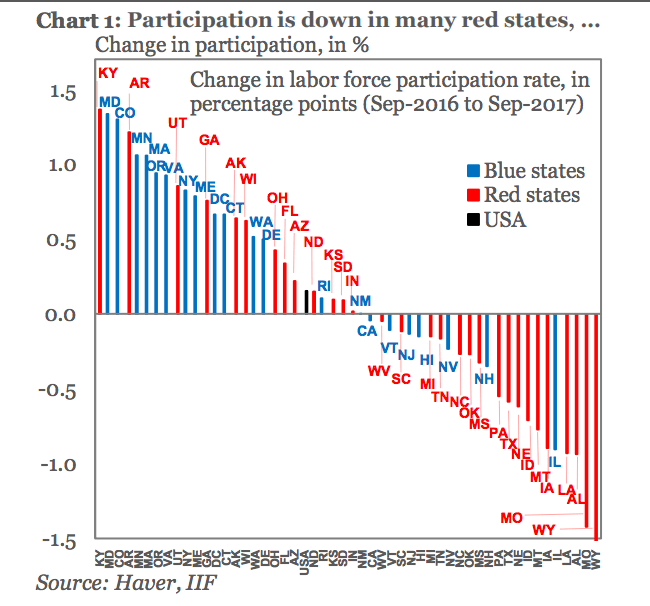 Red vs Blue States – Recovery? 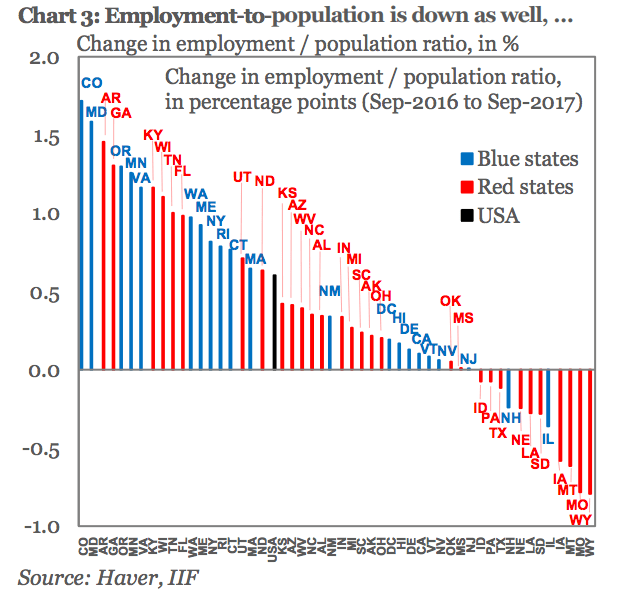 Red vs Blue states in jobs recovery. Even when we have a barely progressive herd in Congress, the nation gets to deal with states often controlled by incompetents and other flavors of reactionary. We have a long hard struggle ahead to get this nation back on anything approaching an even keel. Including equal opportunities. 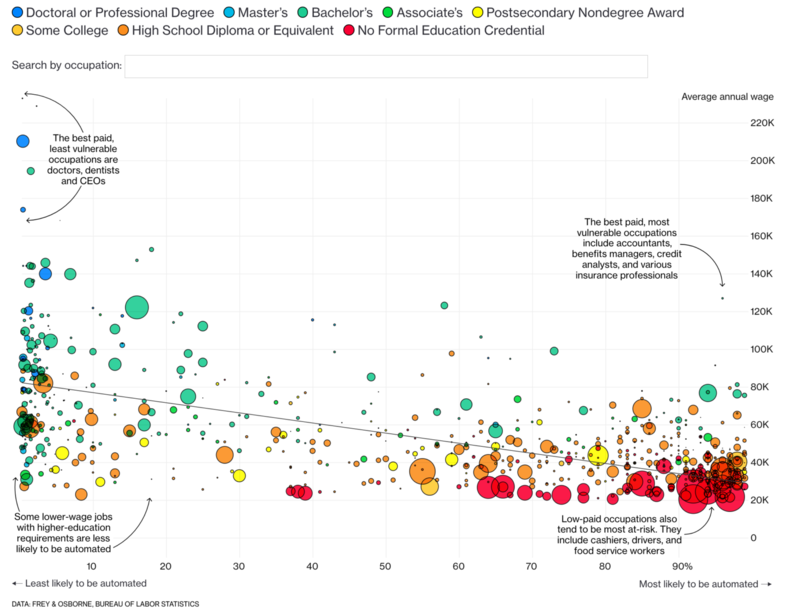 Here’s a link to the article sourcing these graphs. RTFA for more graphics, statistics. ❝ It’s easy to blame all of the industry’s woes on Amazon, the online giant. There’s little doubt that the fifth-largest U.S. company by market cap has been disrupting traditional retailers…But online is far from the only source of retail’s problems: The large chains, the malls they usually find themselves in, and even flagship urban stores have failed to adapt to rapidly changing consumer tastes. This lag has been readily apparent for more than a decade. ❝ My present views are even less optimistic. 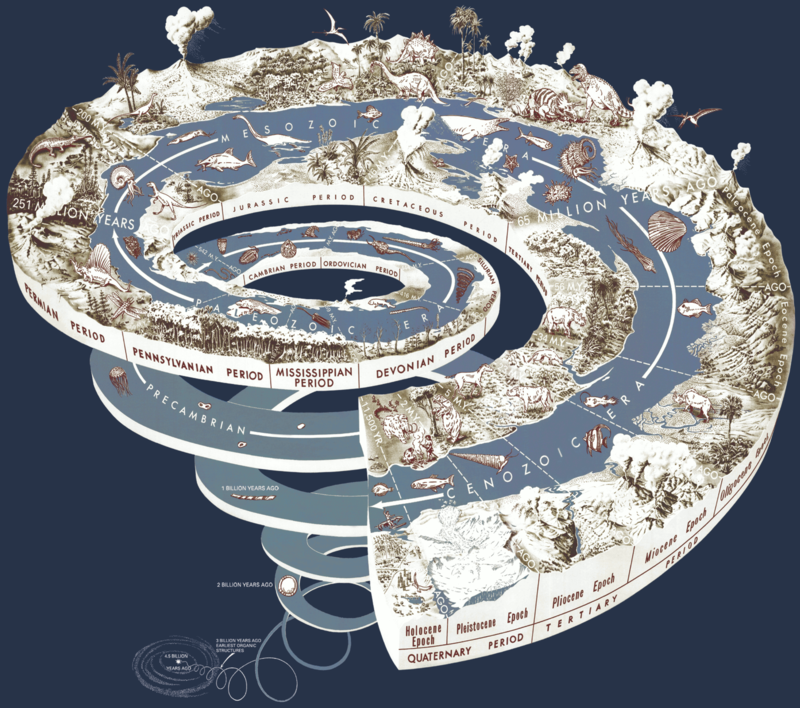 We are probably closer to the beginning of that transition than the end. This is a generational realignment in the way consumers spend their discretionary dollars, and the ramifications and economic dislocations are going to last for decades. ❝ The build cycle. One aspect of the “overstored” issue is the mismatch between retail trends and the construction cycle. Trends change much faster than permits can be issued, buildings constructed and subsequently rented. That lag can be consequential. Look at the growth in big malls since the 1990s. Forbes notes that “since 1995, the number of shopping centers in the U.S. has grown by more than 23 percent and the total gross leasable area by almost 30 percent, while the population has grown by less than 14 percent.” All of the retail construction reflected a very ’90s shopping perspective, one that’s considerably different today. It is more than just the rise of the internet: Sport shopping, retail therapy, and conspicuous consumption offer less prestige today than they once did. ❝ Those warnings about excess retail space are almost a decade old. If anything, the existential threat to the consumer retail industries are even more acute today. 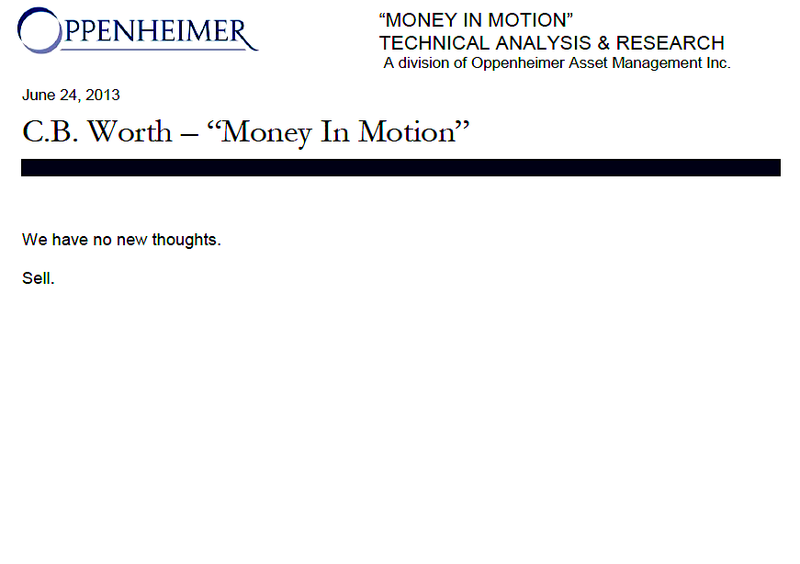 Most of Barry Ritholtz’s writing gets onto this site – when I feel it fits – pretty quickly. 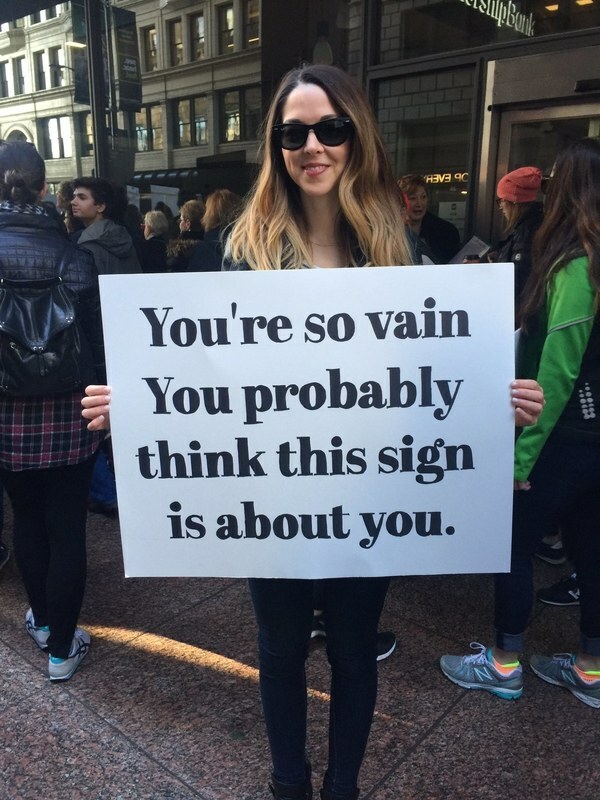 Been saving this one for more than a couple of weeks. Reports the past few weeks continue to bear out everything in this piece he wrote for Bloomberg in March. The great Howard Davidowitz matches Barry’s analysis with even more colorful language and greater forecasts of doom for shopping center and mall anchor stores. 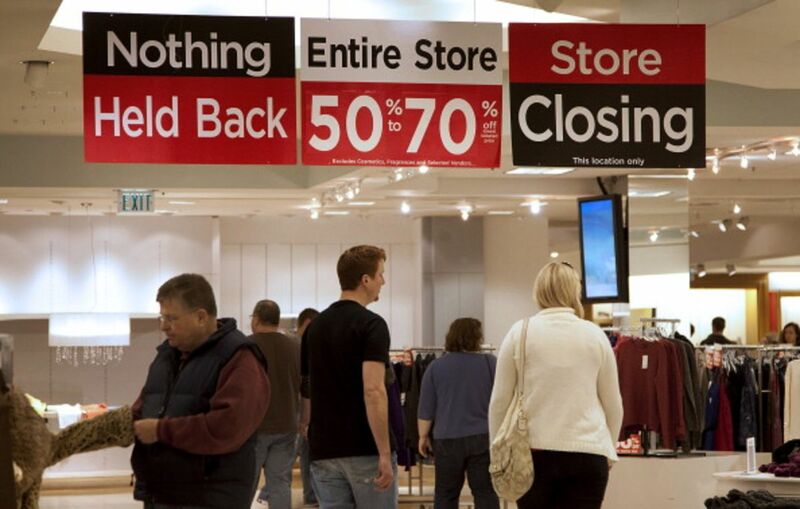 Keep your eyes open for bargains at “Going Out Of Business” sales!